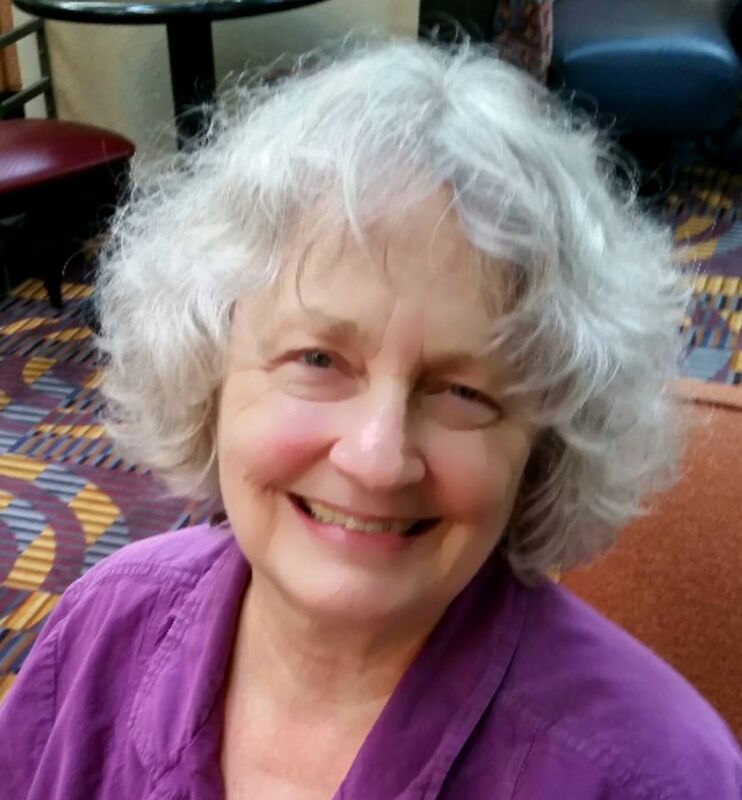 For several years, I have longed to return to a more sadhana-conducive environment in a natural setting, while at the same time, satisfying Swami Kripalu’s wish for a place in the United States where westerners could engage in this marvelous sadhana. I have carried around a concept for how to do this for several years. I used to think of it as my “onion” metaphor, because of the layers that wrap around a core element. This core element is the unique feature of the onion concept. It is perhaps the smallest piece, with probably the fewest people, but everything else revolves around it to create five layers of community with a place for nearly any spiritually-minded individual or family. SKY stands for Shaktipat Kundalini Yoga. This practice (Surrender Meditation) requires special conditions that do not presently exist elsewhere in the U.S., and are desperately needed. They preclude distractions such as having to earn a living, deal with snakes and predators (including human ones), peacocks, traffic and other forms of noise pollution, and special living conditions such as appropriate dwellings, abundant water and other provisions as stated in the shastras (spiritual texts). I feel that all this can best be accomplished in a community that can serve and be served by this core element of SKY residents (myself and those who join me). The Core of full time SKY residents shares its knowledge with other layers, and is supported solely by the other layers of the community (no, we won’t live in mansions, but we will be comfortable). Not all SKY practitioners want to do it full time, but they often want and need to spend some time in quiet and solitude in this kind of environment, where there are others practicing the same sadhana. This layer is their retreat. As students of Durga Ma, they have priority access to The Core. This part of the community is supported in part by time shares, dowries and/or lodging fees, and the outer layers of the community. This layer provides a spiritual retreat of peace and solitude for people of any path. No events or activities need be planned for retreat guests, though they may seek out contact with residents of The Core by appointment, and may utilize the various services provided by the Interface (layer 5). This layer of Open Retreats is supported in part by lodging fees and by layers 4 and 5 of the community. People of all ages living within the community, whether retired or working within or outside the community, are represented here, along with gardens, schools, community centers, etc. Residents establish their own dwellings within prescribed parameters, which may include individual or communal homes. Residents are self-supporting and pay dowries and/or rents which in turn help to support the inner layers. This layer represents establishments such as spiritual centers, conference centers, monasteries, churches, temples, yoga studios, healing arts practitioners, various small businesses, markets, spas, eateries, etc., where residents may work and where people from outside the community may come for services and products. The onion is a visual image of the concept. Keep in mind that such a community would unlikely be as cut-and-dried as this “onion” makes it appear. One thing to keep in mind however, is that The Core is protected and provided for by the outer layers. It is this Core that is the unique feature of this Community. This circular diagram is for the purpose of showing how the community works, not that it is round in shape, or even that the size of a ring necessarily represents any actual size of property or populace. 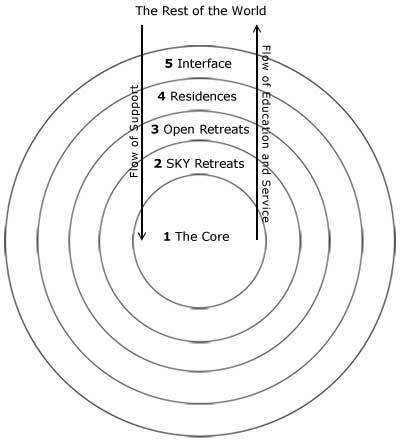 Concentric circles just seem to be the best way to show the relationship of the members of the community and how more conventional life styles can coexist in concert with more unconventional ones, such as The Core of SKY residents. This concept was begun many years ago, began to take off, and ultimately failed. The saying, “One rotten apple spoils the whole bushel,” applies in this instance. This experience has taught me to pay closer attention, and to screen all applicants (I won’t be doing this alone, either). If you are interested in any aspect of this community, we recommend that you first explore durgama.com to see who we are, and contact us using the form below to let your wishes be known.